Prime Minister Narendra Modi will be travelling to Russia in June as a reaffirmation of the ties between the two countries. The official reason for the PM’s visit is to attend the St Petersburg International Economic Forum where India has been invited as a guest nation. The Forum is an annual event dedicated to economic and business issues and is popularly called the “Russian Davos.” It was first held in 1997. The PM’s three-day visit from June 1-3 will also provide an opportunity for India to raise some of its concerns with Russia. Of late, Russia has been edging closer to both China and Pakistan in strategic concerns like the Taliban problem in Afghanistan and for India that opens up a set of grave concerns. People privy to the developments said the PM is likely to travel to Israel in June or July and is also expected to stop in Kazakhstan on June 7-8 for the Shanghai Cooperation Organisation summit where India will be admitted as full member along with Pakistan. 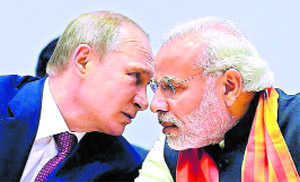 Terrorism, regional situation and rise of Islamic State are some of the issues that will be the focus when Modi meets Russian President Vladimir Putin. National Security Adviser Ajit Doval just concluded a visit to Russia on January 30-31 where he met Nikolai Patrushev, Secretary of Security Council. Sources said Doval raised the issue of Afghanistan and Russia’s outreach to Pakistan. By the time, the PM travels to Russia, the new trajectory of bilateral ties between the US and Russia under President Donald Trump would also be a little clearer. For India today, it has become imperative that it balances out relations with both Russia and the US.